The employment outlook for special education teachers is expected to remain favorable over the next decade. Job openings will be available for qualified individuals with a passion for helping youth cope with learning, emotional, physical, or mental disabilities. Special education teachers are licensed educators who adapt general curriculum to accommodate the unique needs of students with mild to severe disabilities. They help students with autism, blindness, deafness, ADHD, dyslexia, Down syndrome, cerebral palsy, epilepsy, etc. turn their disabilities into abilities. Special education teachers play a pivotal role in developing Individualized Education Programs (IEPs) for students to maximize their learning potential. Special education is a rewarding career filled with PreK-12 employment opportunities for aspiring teachers who are patient, compassionate, and flexible. According to the U.S. Census, 2.8 million school-aged children with disabilities across the United States qualify for special education services. That’s approximately 5.2 percent of America’s youth aged 5 to 18. Increased awareness of various disabilities has caused higher enrollment in elementary and secondary special education programs. As more children are properly diagnosed, the number of special education teachers will grow. The BLS predicts that employment of special education teachers will grow as fast as average by six percent through 2024. This will open roughly 31,000 new jobs nationwide in special education. Special education is a demanding job, so job turnover and retirement will cause the need for new hires. Job growth will likely vary by state depending on the amount of available government funding for public education. The highest need for special education teachers will be in the South and West. Special education teachers willing to work in inner-city urban or underserved rural schools will have a promising outlook. Employment prospects are better in certain special education specialties also. Teachers trained to work with children with multiple disabilities, severe disabilities, speech/language impairments, or autism spectrum disorders are in high demand. An increased focus on early childhood intervention has spiked job creation too. Special education teachers can even find jobs outside PreK-12 schools in daycare centers, residential programs, hospitals, and students’ homes. Taking advantage of the positive job outlook for special education teachers will require that you obtain at least a bachelor’s degree. Universities typically offer a Bachelor of Arts (B.A.) or Bachelor of Science (B.S.) in Special Education. If not, consider majoring in elementary education or a content area while minoring in special education. 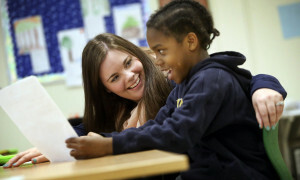 You’ll have to successfully complete a student teaching semester working with disabled youth. Certification requirements vary by state, but most mandate that you pass the Praxis exams and a background check. States like New York will require a master’s degree to maintain licensing. Earning a Master of Education (M.Ed.) in any special education specialty area can unlock more career options. Special education teachers equip their students with the tools to progress beyond their limitations and achieve success. Although the average yearly salary of special education teachers is decent at $56,460, the intrinsic rewards are very lucrative. Not only do special educators teach math and English, but they also give students the life skills to live independently. If you’re interested in this profession, you’ll be happy to learn that the employment outlook for special education teachers is bright.